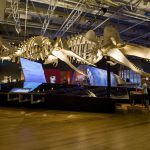 Interactive and immersive, this exhibit featured the latest in international cetacean research, Whales: Giants of the Deep brought adults and children eye to eye with some of the world’s most elusive creatures. The exhibition’s unique blend of science, storytelling, and innovative interactivity gave visitors the opportunity to discover more about the world of whales. 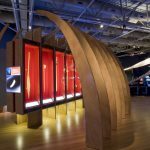 Featuring two fully-articulated sperm whale skeletons, including an impressive 58-foot male, Whales showcased amazing and rare specimens from New Zealand’s Te Papa Museum’s whale collection, one of the largest in the world. Visitors saw life-size and scale models of whales common to the South Pacific as well as contemporary whalebone treasures such as weapons and chiefly adornments. They’ll also learn about whale biology, the extraordinary evolutionary journey of whales from land to sea, and the history of whaling in New Zealand. 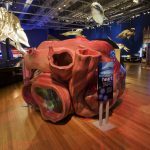 Whales: Giants of the Deep was developed and is presented by the Museum of New Zealand Te Papa Tongarewa. This exhibition was made possible through the support of the New Zealand Government and the Smithsonian Institution.